I’m thrilled to announce that two journalism projects I worked on in the past year have been recognized by the Society of Professional Journalists! The story Heather Mongilio and I wrote after the disappearance of The Eagle‘s last print edition (that featured a cover story on an investigation of TKE hazing) is a finalist for a Mark of Excellence Award for breaking news coverage. Additionally, “Half the Battle,” a journalism project on millennial veterans by American University School of Communication with cooperation from WAMU, is also a Mark of Excellence Award finalist for online feature reporting! I’m so thankful to work with such great journalists. We’ll know at the end of the month how each placed in the region and if they’ll be sent on to the national competition. In the meantime, I’m buying my ticket to the regional conference in D.C. post haste. 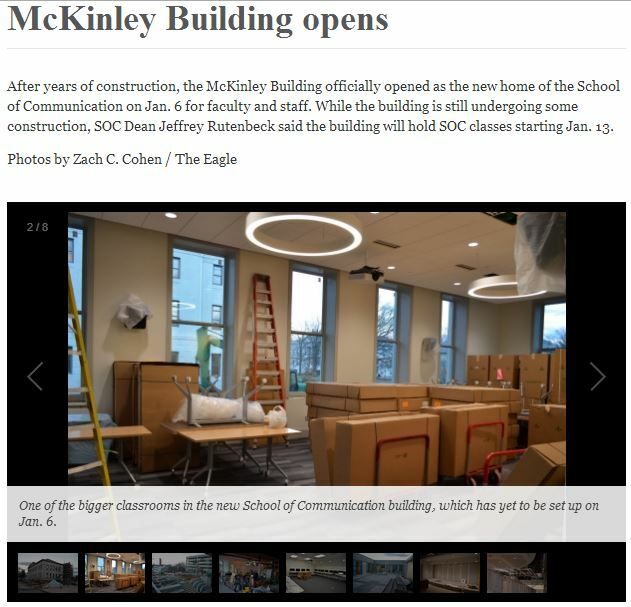 Starting off the new year in journalism by creating a photo gallery for The Eagle on the opening of American University’s School of Communication’s new home in the McKinley Building. Though up and running, there are still plenty of areas under construction. 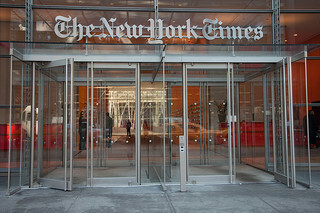 I had the pleasure of interviewing New York Times Public Editor Margaret Sullivan on Friday. The majority of our conversation focused on her column after the massacre in Newtown, Conn. and journalism’s prerogatives in breaking news situations, the subject on my upcoming maiden piece for PBS MediaShift. SULLIVAN: Are you a student at American? SULLIVAN: Ah, that’s great. I understand they have a good program. And that’s that. Maybe the School of Communication can take that to the bank? Check in soon to see the full piece on how America’s newsrooms handle breaking news.